Think about what happens to our hearts when we’re near Jesus. 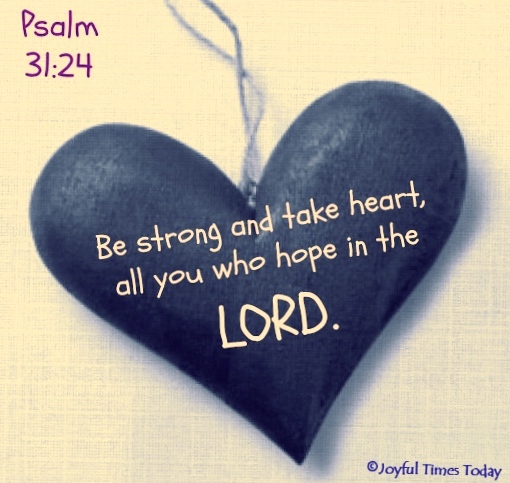 To “take heart” means “to be encouraged and confident.” The New Testament records only the Lord using this phrase. Imagine having Jesus stand near you and speak courage to your heart, knowing that He backs up His words with powerful action! Though Jesus is no longer physically with us on earth, His Spirit is in us – and He speaks and acts powerfully in our behalf. So take heart…take heart. It was just a few hours later when we got the call that our beloved nephew passed away. He was only 23. Never before have I needed Jesus’ instruction to ‘take heart’ more. And it was His words that I clung to this week as we memorialized Myles. As his brother said at the memorial, “Myles death was a tragedy, but not his life.” I couldn’t agree more. He was a dear, sweet, sensitive boy whose life took a brief detour as many do in adolescence, but he never lost the sweetness that was the essence of him. Eventually, the road he was on led him back to us, and we welcomed him home with open arms. We were all blessed to have shared a glorious weekend with him in September at his sister’s wedding – our last memories together. I will cherish them always, and thank God for giving us that gift. Now that the memorial is over and the family has dispersed back to the demands of daily life, Christmas looms ahead of us. Sadly, suffering and tragedy don’t take holidays. Life goes on as usual: people die, the news from the doctor isn’t good, the dreaded surgeries still occur. And those are just samples from the emails I received the past few days. This world is messy, so why would we expect Christmas to be any different? Initially, I wondered whether it would be disrespectful to celebrate Christmas in light of our loss, or whether I’d even be able to muster enough enthusiasm to participate. After much thought, I believe it’s more important than ever to celebrate the birth of the One who will eventually restore our broken lives and our broken world. The gift of Christmas is the hope of heaven given to us through the birth of Christ. It is into this hope that I choose to lean for support and comfort. It is this hope that fills me with confidence and encouragement that Myles is at home with his Heavenly Father, loved in a way that none of us can experience in this world. It is this hope that assures me I will be reunited with Myles one day. I am broken, bruised and battered for sure – but not shattered. Because Christ lived, I can ‘take heart’ even during this dark night of my soul. Especially in times of intense pain, I can’t think of anything I need more than to be reminded that eventually, “He will wipe every tear from their eyes. There will be no more death or mourning or crying or pain, for the old order of things has passed away.” (Rev 21:4) This is the promise and meaning of Christmas. It’s a truth we need to choose to embrace and celebrate, especially when faced with such unbearable heartache. There is no shortage of suffering in this world. I don’t know anyone who couldn’t benefit from a fresh infusion of the light of Christmas for healing of all kinds. What was I thinking!? Of course we need to celebrate Christmas! It’s the only thing that makes sense in this crazy world. And it’s not going to be Santa to provide the gifts I need. There’s nothing he can put in my stocking to compare with the Divine gift of God’s peace, comfort and healing. He alone can offer a peace that transcends human understanding and a joy that can overcome any circumstance. For those of you experiencing your own dark night of the soul, I’ll leave you with Jesus’ words from John 16:33.